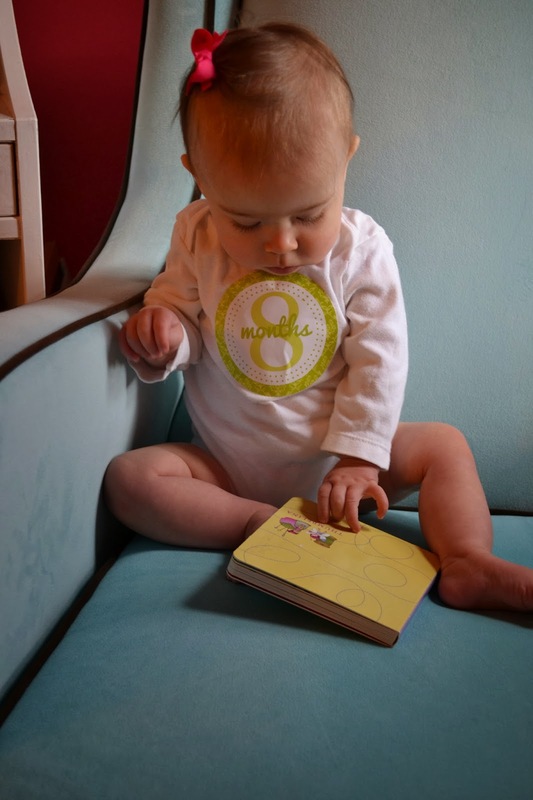 Luscious Life & Decor: Summer is 8 Months! 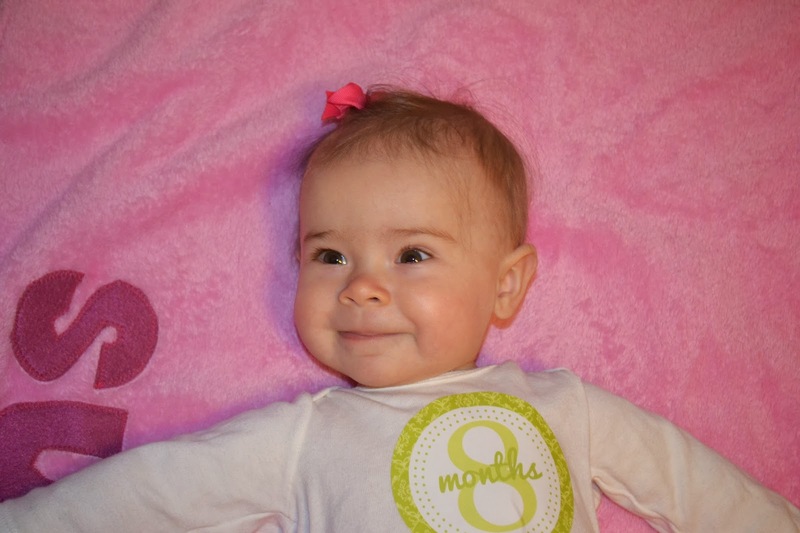 On January 5th Summer turned 8 months. She is long and skinny. She is a little peanut at only 14 pounds. But, she loves to eat! People always comment how tiny she is. She is so strong, though. Summer started crawling a few weeks ago (December 20th to be exact) and hasn't slowed down. Not only is she crawling, but she is showing signs she will be a climber. She is already pulling herself up and climbing on things (boxes, toys, me). I think she will be an earlier walker than Ellie. My friend told me that once they pull themselves up it's usually about 3 months later they start walking. Ellie walked at 14 months. I'm sure Summer can't wait to keep up with her big sister! There was a period last month where she was fussy and not herself (related to the flu shot and teething, I think), but she is back to her happy self. She is taking two naps a day with the morning one being her longest. She wakes up around 8 usually (sometimes later), then I nurse and give her yogurt for breakfast. I just started her on yogurt and added this as her second meal last week and she loves it. She will nap usually two hours after she wakes and naps again at 1:30 for an hour or so. She is asleep for the night at 6:00. I am still making all of her food into a puree and she loves to eat. Her favorite food so far is butternut squash. Her least favorite is banana (mine, too). 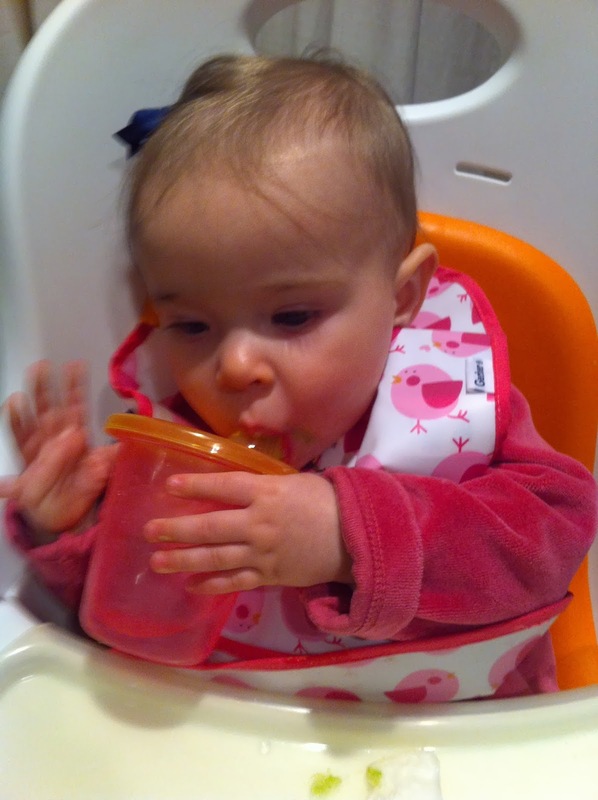 She will drink from a sippy cup (or cup) and is able to do it all by herself! I gave her baby mum-mums for the first time and she had fun eating them in her high chair. 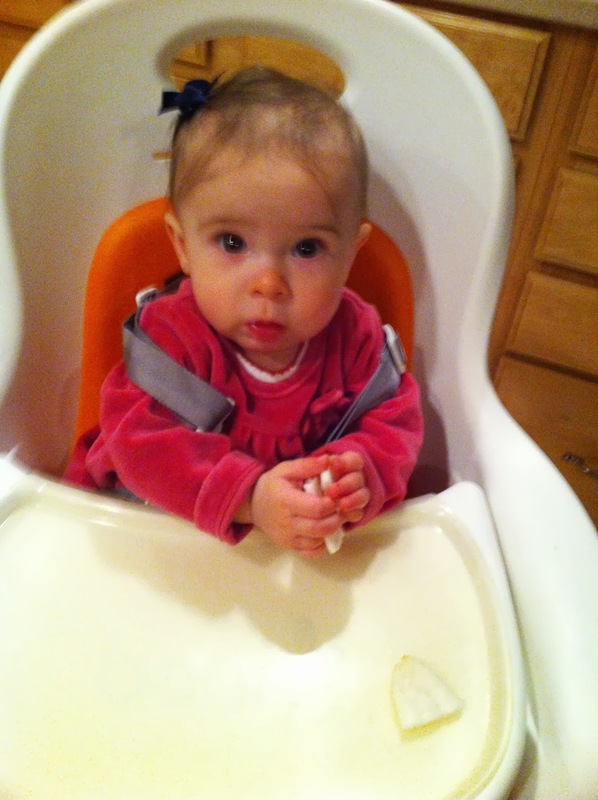 She is finally content in her high chair. 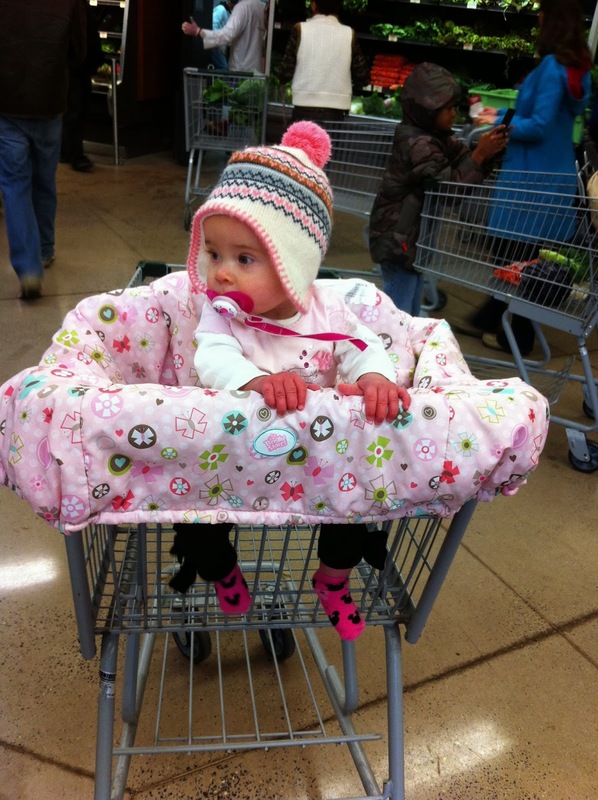 Thank goodness I don't have to hold her and feed her anymore. I never failed to get her food in my hair or on my clothes. We started music class again last week and she is now almost two months older from when we ended the last session. She loves watching the other kids, listening to the music, and eating the instruments. I am also signing her up for swimming lessons. Ellie started at the same age and loved it. I am looking forward to having some one on one bonding time with Summer. She loves playing with her toys and eating her Little People. Since my dressing room is still part of Summer's nursery that's where I get ready in the morning. I always find my girls hanging out in my closet. Already going through my clothes and shoes. 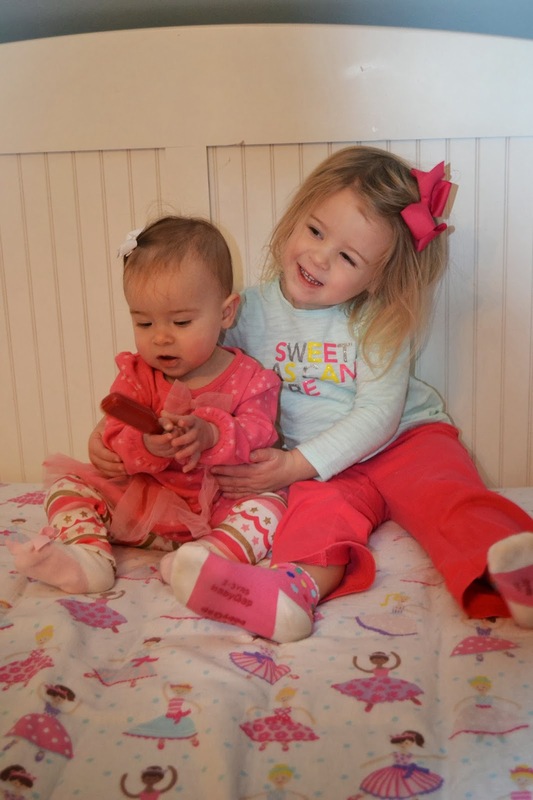 Ellie is still such an awesome big sister. 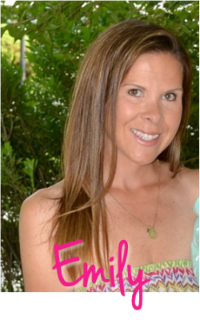 She still has shown no signs of jealousy and is so loving towards her. Lately Ellie has been repeating me and calls Summer, "sweetie" and "sweet pea." It's so cute. She loves touching her. Maybe a little too much. When Summer is crawling Ellie tries to caress her cheek. 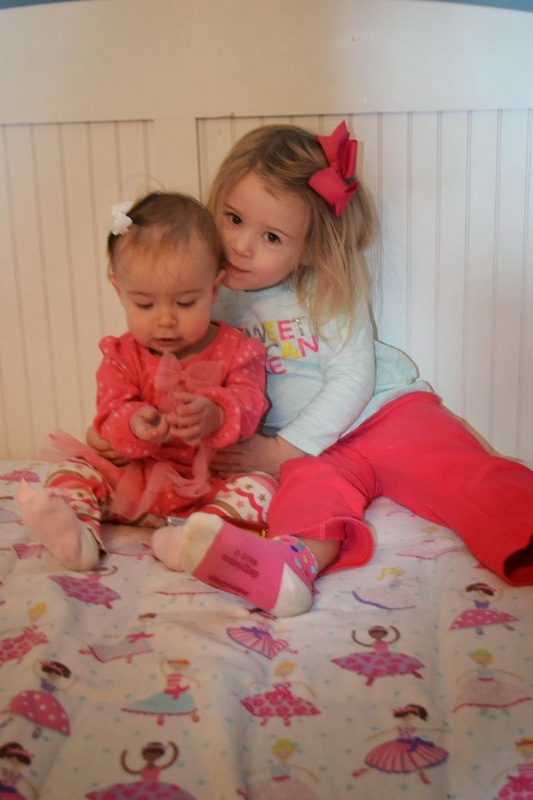 She just can't get enough of her baby sister! Ellie is so receptive when I ask her to make sure there is nothing too small on the floor that Summer could possibly put in her mouth or when I ask her to get me something. I always make sure I spend lots of one on one time with Ellie, too. During Summer's naps we paint, read books, and play with her toys. Still so often and out of the blue Ellie will say, "I love you Mommy." And, most recently, she says, "I want you, Mommy" and comes to me with open arms. She really knows how to make me happy!